At twelve years of age, Thomas left Angus Hill Board School and found employment as an errand boy for a local chemist shop. Three years later he became an engine cleaner on the Great Western Railway. In 1892 he passed his fireman's exams and began work at a colliery in the Sirhowy Valley. Thomas joined the Associated Society of Railway Servants Union. He played an active role in union affairs and eventually became a full-time organiser of the union. Thomas was also involved in politics joining the newly formed Labour Party and was elected as a councillor for Swindon. In 1909 the Derby Trades Council became unhappy with the performance of Richard Bell, the local Lib-Lab MP and in 1909 made it clear they would not support him in the next parliamentary election. Bell decided to stand down and the local Labour Party asked Jimmy Thomas to be their candidate. Thomas accepted the offer and in his election address he called for an increase in taxes on the rich and the abolition of the House of Lords. In the 1910 General Election Thomas received 10,239 votes, over 2,000 more than the nearest Conservative Party candidate. While in the House of Commons, Thomas retained his position in the union and helped organise the strike of 1911. The following year he was an important figure in the amalgamation of several unions to form the National Union of Railwaymen (NUR). 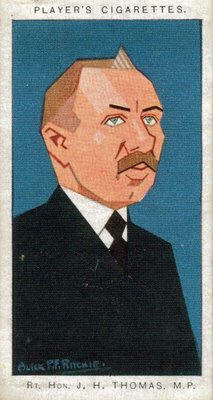 In was elected General Secretary of the NUR in 1917 and two years later led the successful railway strike of 1919. When Ramsay MacDonald became Prime Minister after the 1924 General Election, he appointed Thomas as Secretary of State for the Colonies. During the proposed General Strike in 1926 Thomas was asked by the Trade Union Congress to help reach an agreement with the Conservative Government and the mine-owners. According to Thomas they were close to agreement when Stanley Baldwin broke off negotiations. The reason for his action was that printers at the Daily Mail had refused to print a leading article attacking the proposed strike. The TUC negotiators apologized for the printers' behaviour, but Baldwin refused to continue with the talks and the General Strike began the next day. When the Labour Party returned to power after the 1929 General Election, Thomas became Lord Privy Seal in MacDonald's government. This coincided with a serious economic depression and in 1931 Philip Snowden, the Chancellor of the Exchequer, suggested that the Labour government should introduce new measures including a reduction in unemployment pay. Several ministers, including George Lansbury, Arthur Henderson and Joseph Clynes, refused to accept the cuts in benefits and resigned from office. Ramsay MacDonald was angry that his Cabinet had voted against him and decided to resign. When he saw George V that night, he was persuaded to head a new coalition government that would include Conservative and Liberal leaders as well as Labour ministers. Most of the Labour Cabinet totally rejected the idea and only three, Thomas, Philip Snowden and John Sankey agreed to join the new government. MacDonald was determined to continue and his National Government introduced the measures that had been rejected by the previous Labour Cabinet. Labour MPs were furious with what had happened and Thomas, Ramsay MacDonald and Philip Snowden were expelled from the Labour Party. In October, MacDonald called an election. Thomas, who stood as a National Labour candidate in Derby, won his seat in the 1931 General Election and afterwards served as Secretary for the Colonies in the government. Thomas held his government post until May 1936, when he was accused of leaking Budget secrets to his stockbroker son, Leslie Thomas, and Alfred Cosher Bates, a wealthy businessman. In a Judicial Tribunal set up by the government, Bates admitted giving Thomas £15,000 but claimed it was an advance for a proposed autobiography. This high sum for an autobiography, not yet written, only increased suspicion of the two men's relationship, and Thomas was forced to resign from the government and House of Commons. Thomas resigned both post and seat, telling the Commons, in a moving farewell, ‘my vices, if they are vices, have always been open and never disguised’. Henry 'Chips' Channon wrote of his resignation statement I reached the Chamber at 3 p.m. and found it expectant and nervous. At 3.30 J. H. Thomas entered, sad and aged, but sunburnt still. He sat immediately below the gangway on an aisle seat. Very soon took place one of the most poignant scenes the House has ever witnessed, when the Speaker quietly said 'Mr Thomas' and the poor man rose. He read a written statement which was simple and rather heartrending. He accepted the findings of the tribunal, but declared that he had never consciously betrayed a budget or any other secret. He was leaving the "Ouse' after twenty-seven years in its midst. He had now only his wife who still trusted him and loved him. He hoped no other member would ever be in a situation as cruel, as terrible as the one he today found himself in. Then he sat down for only a second, and there was a loud murmur of pity and suppressed admiration through the House. There was scarcely a dry eye. Mr Baldwin sat with his head in his hands, as he often does, Winston Churchill wiped away his tears. Thomas then rose again and slowly made his way out, not forgetting to turn and bow, for the last time, to the Speaker." Thomas retired to his home, Millbury House, Ferring, where he wrote his autobiography, My Story (1937). Jimmy Thomas died on 21st January 1949.